The Contest begins on Wednesday 10 April 2019, at 9:00am AEST and ends on Friday 26 April 2019, at 5.00pm AEST (Promotion Period). The contest is open to Australian residents only, who are aged 18 years and older. Employees, immediate family members of employees, employees of any company associated with the Promotion are ineligible to enter. To enter, eligible entrants must enter their name and email via the submission form (https://thebeautychef.com/pages/byron-at-byron) and during the promotion period. The random prize draw will take place at 10:00am on Monday 29 April 2019, at Suite 11, 402 New South Head Road, Double Bay, NSW 2028. 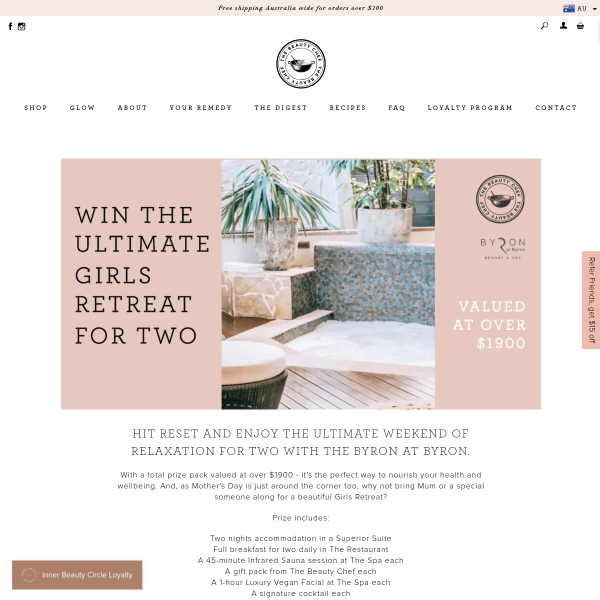 The winner will receive a wellness weekend for two at The Byron at Byron, plus 2 x The Beauty Chef prize packs valued at over $1900*. Two nights accommodation in a Superior Suite, full breakfast for two daily in The Restaurant, a 45-minute Infrared Sauna session at The Spa each, a gift pack from The Beauty Chef each, a 1-hour Luxury Vegan Facial at The Spa each, a signature cocktail each, a bottle of Australian sparkling wine to share and enjoy, a cheese platter to share during your stay, complimentary daily yoga and complimentary Wifi. Flights, transfers and transport to and from the destination are NOT included in the prize. Winners will be notified by email within two (2) business days of the draw and must submit their postal address to The Beauty Chef to claim their prize. The prize certificate will be sent to one nominated address only. The winner may have their details published on The Beauty Chef’s Facebook and/or Instagram account. *Conditions apply – This offer is subject to availability at time of booking and is valid for 6 months only, excluding Friday and Saturday nights, public holidays, school holidays and major event periods. Please note also that this voucher is nonexchangeable, non-transferable and not redeemable for cash. Valid for two people only. Voucher must be presented on arrival. Only available to residents of Australia who are aged 18 years and older.